1:52 min See how we can help protect your information in the cloud. McAfee MVISION Cloud (formerly Skyhigh Networks) protects data where it lives today, with a solution that was built natively in the cloud, for the cloud. It’s cloud-native data security. 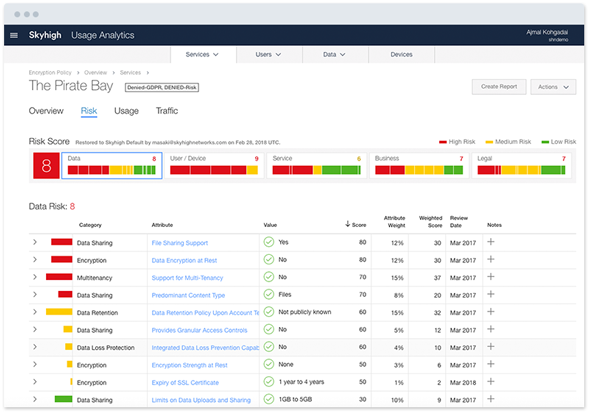 Gain complete visibility into data, context, and user behavior across all cloud services, users, and devices. Apply persistent protection to sensitive information wherever it goes inside or outside the cloud. 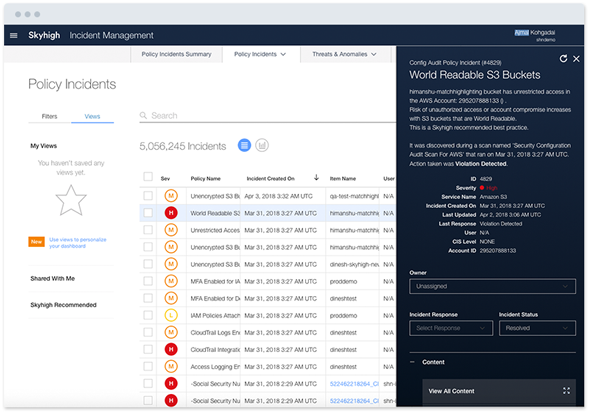 Take real-time action deep within cloud services to correct policy violations and stop security threats. McAfee’s content engine automatically classifies sensitive information. Next, McAfee enforces controls to remove or quarantine sensitive data in the cloud and prevent data loss via cloud-based email and messaging. McAfee’s context engine detects granular file and folder permissions, including all owners, editors, and viewers. The solution enforces collaboration policies in real time by downgrading permissions, removing permissions, and revoking links. McAfee summarizes cloud usage including cloud services in use by user, along with the risk profile of those services with a 1-10 CloudTrust Rating. Leverage the largest and most accurate cloud registry to enforce risk-based policies. McAfee understands access context including device operating system, device management status, and location. Enforce access policies that prevent the download of sensitive data from corporate cloud services to untrusted devices. McAfee leverages machine learning to build behavior models that detect active account compromise and insider threats. The solution also leverages signatures and sandboxing to identify malware in the cloud and stop threats. McAfee enables you to encrypt your sensitive data in the cloud using encryption keys you control, so no third parties, not even the cloud provider, can access your data. Protect your data while preserving functions such as search. McAfee automatically audits the security configuration of cloud services and suggests modifications to improve your security posture based on industry best practices. You can also audit user permissions and tighten excessive permissions. Download the McAfee MVISION Cloud datasheet for a complete list of product capabilities and deployment architecture. Applies unified policies to all cloud services across data at rest and in transit. Leverage policy templates, import policies from existing solutions, or create new ones. 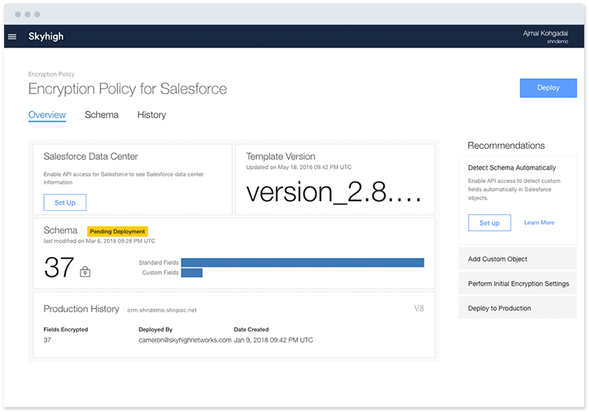 Define customized policies using rules connected by Boolean logic, exceptions, and multi-tier remediation based on incident severity. 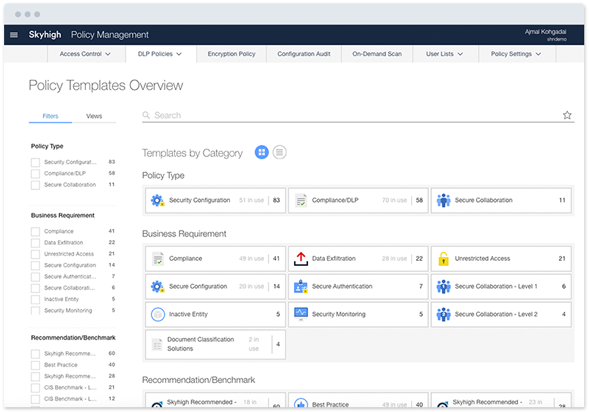 Delivers out-of-the-box policy templates based on business requirement, compliance regulation, industry, cloud service, and third-party benchmark. Provides the world’s largest and most accurate registry of cloud services with a 1-10 CloudTrust Rating based on a 261-point risk assessment. Leverages an irreversible one-way process to tokenize user identifying information on premises and obfuscate enterprise identity. Leverages artificial intelligence to understand apps and map user actions to a uniform set of activities, enabling standardized monitoring and controls across apps. Automatically builds a self-learning model based on multiple heuristics and identifies patterns of activity indicative of user threats. 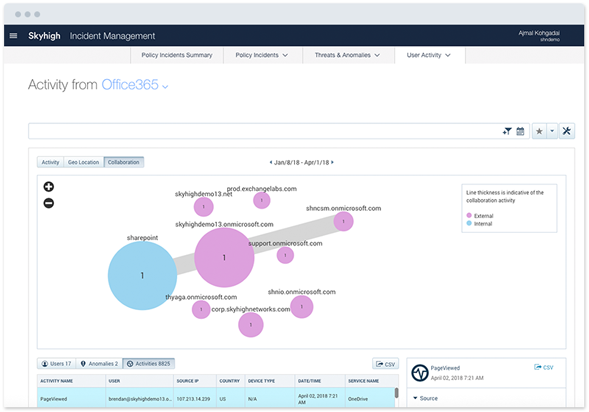 Enforces a uniform set of policies across all cloud service instances, with the ability to associate policy violations and investigate activities, anomalies, and threats at an instance level. Leverages keywords, pre-defined alphanumeric patterns, regular expressions, file metadata, document fingerprints, and database fingerprints to identify sensitive data. Detects granular viewer, editor, and owner permissions on files and folders shared to individual users, everyone in the organization, or anyone with a link. Understands access context including device operating system, device management status, location, and corporate/personal accounts. Discovers current cloud application or infrastructure security settings and suggests modifications to improve security based on industry best practices. Summarizes cloud usage including cloud services in use by a user, data volumes, upload count, access count, and allowed/denied activity over time. Captures a comprehensive audit trail of all user and administrator activities to support post-incident investigations and forensics. Leverages machine learning to detect activity signaling negligent and malicious behavior including insiders stealing sensitive data. Identifies known signatures, sandboxes suspicious files, and detects behavior indicative of malware exfiltrating data via cloud services and ransomware. Define policies with multiple levels of severity and enforce distinct response actions based on the severity level of the incident. 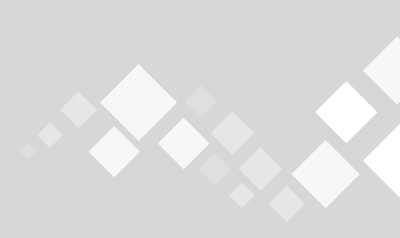 Isolate files that trigger policies in a secure administrative location within the cloud service where it was found. Skyhigh never stores quarantined files. Permanently removes data from cloud services that violate policy to comply with compliance regulations and neutralize malware. Downgrades file and folder permissions for specified users to editor or viewer, removes permissions, and revokes shared links. Enforces coarse allow/block access based on service-level risk and granular activity-level controls to prevent upload and download of data. 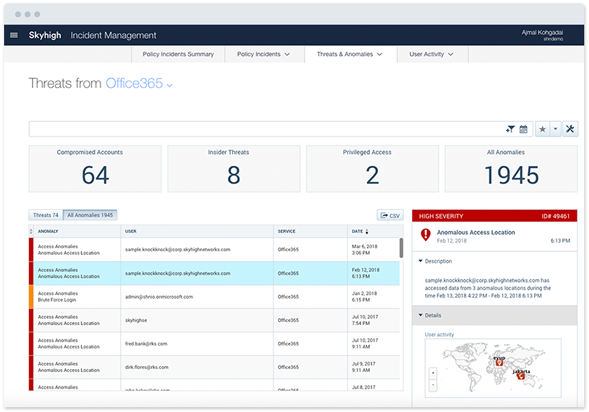 Forces additional authentication steps in real-time via integration with identity management solutions based on access control policies. Coaches users to correct policy incidents, and once corrected, automatically resolves incident alerts to reduce manual review of incidents. Coaches users in real time within the native email, messaging, and collaboration application where the incident occurred. 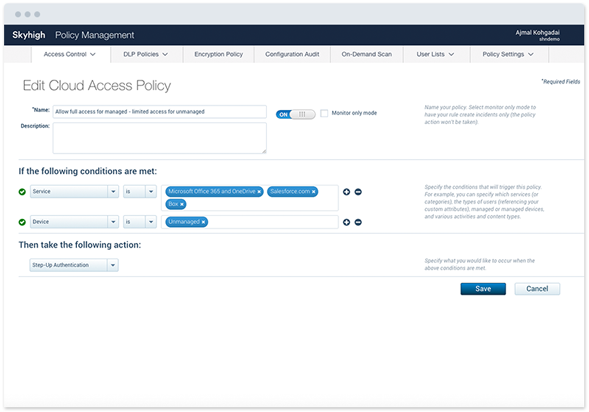 Offers a unified interface to review incidents, take manual action, and rollback an automatic remediation action to restore a file and its permissions. Displays an excerpt with content that triggered a policy incident. Enterprises, not Skyhigh, store excerpts, meeting stringent privacy requirements. Identifies and encrypts existing data found in cloud services and transparently encrypts new data uploaded to the cloud in real time. Preserves end-user functions such as search, sort, and format using academia and peer-reviewed encryption schemes. Replaces sensitive data with a token that cannot be reversed to the original clear text value, meeting strict data residency requirements. Applies rights management protection to files uploaded to or downloaded from cloud services, ensuring sensitive data is protected anywhere.